Mr 5 has recently been interested in flags. And when he gets interested in something he tends to sit down and study it for hours. This month he was steadily learning all the flags of the world and the countries they belonged to, so I decided to give him a project to do. We printed out a free map outlining the countries of the world. I say we, as I got some technical help from Mr Crafty to print it A3 size. I got the map from here (map #3). 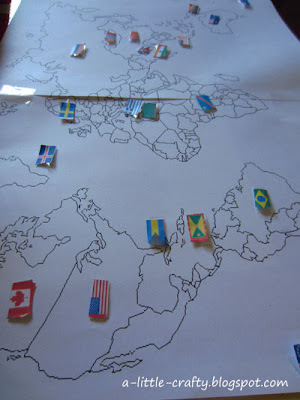 I then used google images to find and then print out all the country flags on one A4 page (so they are nice and small), and gave Mr 5 his new "project". He set to work immediately and cut and stuck in perfect happiness, using his kids atlas to identify the flags he didn't know yet, and find the country (or help me find the country). I'm not sure he'll stick with the project through all 260 flags, but really that hardly matters.